Taking the developer in-house will give Duke more control in a volatile commercial solar market. Asset owners are realizing they can boost commercial solar deployments with greater control of the process. Duke Energy announced Wednesday that it has taken full control of California-based commercial solar developer REC Solar. The acquisition comes after Duke acquired a majority stake in the company in 2015. Duke spokesperson Tammie McGee said it was assumed an acquisition would take place eventually, but that Duke accelerated the timeline in response to market dynamics. "As we see more and more companies, and especially corporates, becoming interested in renewable energy, it became clear that putting our strengths together would help meet that need," McGee said, in a phone interview. "Say you have a big-box store that's interested in putting rooftop solar on their business, which is something REC has expertise in, but at the same time they're thinking more broadly about how to offset their carbon footprint and want to buy large volumes of renewable energy, which is where Duke Energy has its strength," she said. "Working together, we can be a one-stop entity with a lot of experience and expertise in both onsite and offsite renewables." The move follows a trend toward a more holistic set of offerings in the commercial clean energy space, where players like NRG Energy, GE Current and Edison Energy are also active. However, some of these companies have recently gone through some internal shakeups or are in the process of restructuring. Duke's full purchase of REC Solar also follows a trend of commercial asset owners becoming more firmly involved in earlier stages of solar project development, said GTM Research analyst Michelle Davis. In previous years, commercial solar companies either focused heavily on early-stage development or more on financing and project acquisition in the middle to late stages of development. Like other utility affiliates involved in the commercial solar sector, Duke is moving more of those development capabilities in-house. "Asset owners are discovering they can get more pipeline and greater installation volumes if they have more control over their pipeline," said Davis, author of the new Commercial Solar Asset Ownership report. Taking more control eliminates speed bumps like having to repeat due diligence on project financing. When a late-stage purchaser has to duplicate the work of an early-stage developer for quality-control purposes, it wastes time, money and resources. The Duke Energy news follows a recent announcement that Engie has entered into a joint development agreement with Clean Energy Collective, where the two companies will jointly own community solar projects in the Northeast, which is yet another example of a commercial solar owner getting more heavily involved in early-stage development of commercial projects, said Davis. REC Solar will continue to be a part of Duke Energy Renewables, Duke Energy’s deregulated commercial renewables business with experience in offsite solar and wind energy generation, microgrids, battery storage and other emerging technologies. Marking a shift in the opposite direction, Edison International is currently exploring options to sell its commercial solar subsidiary SoCore Energy (slide 20), even as the company seeks new opportunities as "an independent energy adviser and integrator for large commercial and industrial customers" through Edison Energy. Through the end of September, Edison International had invested $228 million in SoCore Energy, with 106 megawatts of commercial solar built and in operation. The sale may reflect the fragile economics of the commercial solar sector, which is highly dependent on state-level subsidies or credits. Roughly 80 percent of commercial solar is installed in just five states, according to Davis. On top of that, there are a lot of complicated financing hurdles. "Even though there are all of these potential clients, most of the time entities like NextEra, NRG, AES or REC are targeting the customers they know have investment-grade credit, which automatically eliminates a huge pool of customers," she said. "Even within that [creditworthy segment], it can still be very complicated to do a contract with a Target or a Wal-Mart or other company," said Davis. "They have their own lawyers that want to look at the contract, and there may be engineering, procurement and construction agreements involved. It can take months to set up a contract with a potential customer." For Duke and others, though, the reward is worth the hassle. 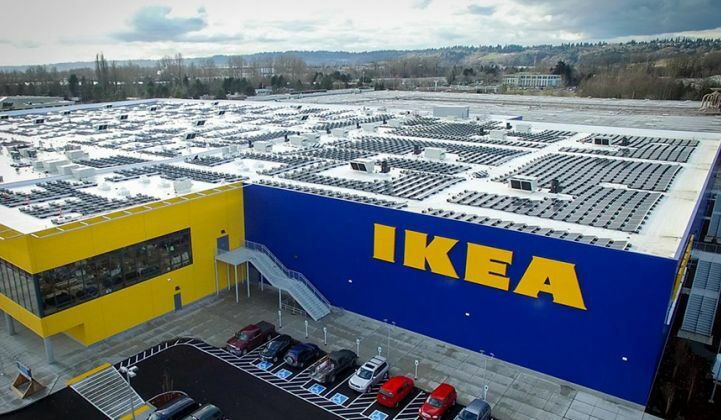 The commercial solar market grew 57 percent last year, according to GTM Research, and is slated to see continued growth as more and more commercial and industrial players look to save money and boost their sustainability credentials through renewable energy purchases.